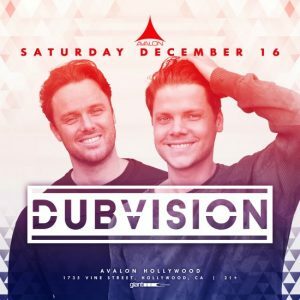 The Netherlands-based DubVision are an in-demand electronic production duo who make high-energy, dance-oriented progressive house music. Formed in 2005, DubVision feature the talents of Stephan Leicher (born in 1981) and his younger brother Victor Leicher (born in 1989). Interested in music from a young age, both brothers were encouraged to study piano beginning around age seven. By his teens, Victor began experimenting with electronic production, followed soon after by Stephan. Drawing inspiration from electronic acts like Tiësto, Axwell, and Swedish House Mafia, the brothers formed DubVision and issued the EP Into White in 2011. Subsequently, they signed to Spinnin’ Records and found success with a string of singles, including 2012’s “You & I” with Project 46 and Donna Lewis; 2013’s “Into the Light” with Sander van Doorn, Mako, and Mariana Bell; 2014’s “Rockin” featuring Firebeatz; and others. During this period, they made numerous high-profile festival appearances, were regularly listed in the Beatport Top Ten, and even scored an overall Beatport number one with 2014’s “Backlash.” Hoping to take more control of their career, they parted ways with Spinnin’ in 2015. The following year they announced their return with the singles “Million Miles” featuring Denny White and “Rise.” They stayed active in 2017, delivering the singles “Geht’s Nacht,” “Under the Stars,” and “Yesterday Is Gone” featuring Jonny Rose.